You would have to be living under a rock at the moment to not know that our country is in drought. Possibly the worst drought we have ever experienced. 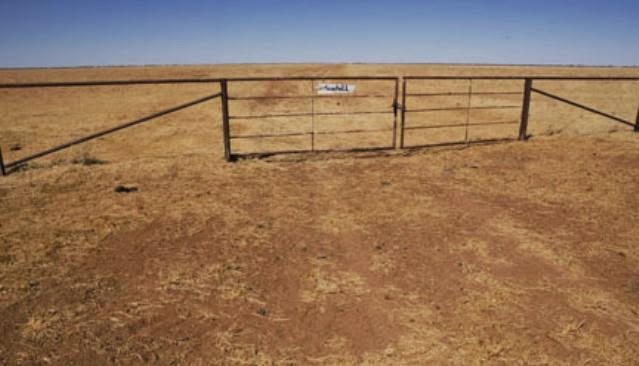 Last month, a QLD farmer made news headlines – by shooting the last of his 400 cattle and then turning the gun on himself. I didn’t know this man but he haunts me daily. He is there is all my quiet moments. Why? Because as an overthinker, I can empathise. He had 400 cattle left. He held out for as long as he could. One more day… one more day… waiting for rain. For rain that never came. Then, he made the gut wrenching, life changing decision to give it all up and send them to market. I can only imagine the stress he experienced at just making that decision. And then to be told that he was too late. The cattle were too far gone, too emaciated to be loaded for market. Can you even imagine? The rock that must have avalanched in his chest when he realised that he waited too long. That he put too much hope in rain clouds. That with no rain on the horizon and no money to buy food or water – the only option left was to put them out of their misery. I imagine that he was a good man. That he used a steady hand and a quiet word for each of them, as our hot, dry country broke him beyond repair. This man haunts me – not because of what he did, but for what he endured, and for what our farmers are still enduring. It is still not raining. There is still no rain on the radar, and our farmers are no doubt sitting around their kitchen tables tonight – hopefully with family, and not alone – making their action plans. So if you are like me, if you feel overwhelmed by the tragedy that is happening and you want to help – the amazing news is that you can. 1. Buy Australian Made. Buy from Farmers Markets if you can, or consider getting home delivery from a company like Aussie Farmers Direct if you can't. 2. Buy Branded Milk – not supermarket generic and know that your milk money is going to Farmers who are being fairly paid. 3. Buy meat from your local butcher. Farmers are selling cattle for as low as $0.08c a kilo and yet we are still paying $20kg+ at the supermarket. Our farmers are being screwed. We are being screwed and the Supermarkets are laughing all the way to the bank. 4. Make a donation to Aussie Helpers. You can literally choose how you want to help – from a bale of hay to a litre of diesel or even a gift card for groceries - and it goes direct to those who need it most. You can even follow them on Facebook to see it all delivered! As foodies, we have all been part of the movement that has created an ethical food campaign – we have embraced free range eggs, organic pork and vegetables that have traveled less than 100km – but we have forgotten the Farmer. We need to be as ethical with our food dollars as we are with our food choices. We can each make a difference, one grocery shop at a time. Please help make a difference. Spring Raspberry Bread and Win $100k! Not that I was all that mighty – but I have definitely fallen, and fallen hard. I find myself 31 years old, heavily pregnant (technically barely 7 months, but I feel like a migrating whale) and living at home with my Parents… not exactly where I saw myself this time last year as we were preparing for our new life in Canada! The only real consolation I have is that it seems to be a bit of a trend at the moment. Kim Kardashian is living in her Mum’s spare room with baby North and Kanye in tow – and even Princess Kate is holed up in her Mum’s guest house with little Prince Georgie – it does help my wounded ego just a little bit to learn that I’m not alone! After what feels like months of upheaval; our little family is finally settled, hubby back at work and our ratbag 2 year old finally sleeping through the night! The last 6 weeks have seen us trudge home from Canada, find a hospital to have our next baby in – and as long as no one beats me to the punch today – we may have even secured a few days of daycare! WOO HOO - Progress! On top of all of that – my brother and his partner have had their first baby – so amongst beautiful newborn cuddles, I have also been faced with the challenge of trying to bake his mummy some treats that will get her through the early weeks of sleep deprivation and won’t upset his new tummy at the same time. 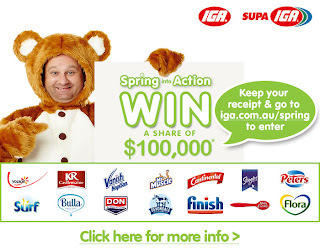 I was pretty excited to get an email about this competition IGA is running – up to $100k in prizes just for choosing selected brands and entering your receipt information online – I can tell you, this has been one of the more expensive chapters in our life – so even a share of $100k will come in incredibly handy right now!! There are lots of great recipes – including one for Cheesy Cornbread and another for Cheese and Onion Tartlets – both by Devondale (who happen to be one of my favourite dairy brands) that will get a test run this weekend just in time for family brunch. Back on to baking and babies though… I was super excited to see this recipe for Raspberry Bread and it was a winner - nutritious, easy and absolutely delicious - but next time I will definitely look at adding some white chocolate chips… and possibly even some roughly chopped macadamia nuts – just to make it extra special! 1. Preheat oven to 150°C. Lightly grease a medium 21.5 x 11.5 x 5.5cm loaf pan with Flora pro-activ. 2. Place flours, hazelnut meal, baking powder, bicarbonate soda and caster sugar into the bowl of an electric mixer. To combine, mix on low speed for about 1 minute. If using a hand beater, mix the dry ingredients using a wire whisk until evenly blended. 3. Add lightly beaten eggs, vanilla and melted Flora pro-activ. Beat on medium speed for 3 minutes. Remove the bowl from mixer and fold in the raspberries and milk by hand. 5. Cool in the tin. Slice into 12 pieces, serve plain or spread with Flora pro-activ Buttery. It has been 12 days now – or should I say nights – since Poppy last slept. So I’m a bit knackered. Dinner has become a blur of microwaved delights, all created while being bashed with an Elmo doll, stepping over the minefield full blown tantrums and trying not to become the mother that locks herself in the hall closet just to eat a biscuit and pretend my life isn’t falling down around my ears. My daughter doesn’t sleep. She’s never been a good sleeper. Even during that mystical newborn phase where apparently all they do is sleep 23 hours a day. Nope. Not even then. Now though, she is almost 2. That is almost 2 years without sleep. I’ve given up trying to find excuses, reasons and magical cures. I think I just need to accept it. During the day I am quite philosophical about it… during the night however it takes all my willpower not to sit in the corner and repeatedly bash my head into the wall wondering what the hell I did in my last life to deserve this. All I can say is – lucky she’s cute. The cheeky smiles don’t make up for exhaustion, but they do give you just that tiny bit more energy to hope that tonight… tonight she might sleep. So while she was at Daycare, hubby took me for an old fashioned Burger date. And we’ve discovered that apparently the local’s favorite burger place here is Five Guys Burgers. I have to say I really liked it. They shop itself is very industrial – white walls, high ceilings and exposed pipes – but the service was genuinely friendly and I loved the way they yelled the orders from the front counter to the grill. Although hardly theatrical, it did add a nice element of fun to the occasion. I got my hamburger with the lot – pickles, grilled onions, all the sauces. The Lot. I like a burger that squishes and all those burger-y juices that run happily down your arm. This definitely ticked the box. My burger was tasty, juicy and nicely put together. Win. Hubby got the Double Cheeseburger with grilled mushrooms and onions. And loved it. We decided on the 5 Guys fries and the serving was MASSIVE. I found them a little plain – but next time we’ll try the Cajun version. These are not Gourmet burgers on any special, fancy breads or foodie style condiments – but they are a good, honest, quality burger. It didn’t cure me of my sleep deprivation, but it did give me a bit of pep to get through the rest of the day. And there were no dishes. Perfect! Saltlik Steakhouse Banff and the Lobster Disaster. But I thought I had everything under control until Poppy developed a love of lobster. Yes that's right - the world’s most expensive shellfish. Sigh. Why couldn't she be a chicken nugget baby? For Christmas we ticked a major goal off our bucket list and had "Christmas at the Castle". It was an unplanned (although heavily lusted after) experience and our spontaneity robbed us of any chance at a traditional Christmas dinner - but lucky for us Saltlik in Banff decided at the last minute to open for Christmas dinner. And so began the lobster disaster. I have always loved to read, and tend to devour books so quickly, that I struggle to justify the cost of buying them. When I was a little girl, I remember reading books that were based in Northern USA / Canada… lots of talk of snow and toboggans, snowmen and hearty winter food… places I could only ever dream of visiting. Two particular books really stirred my imagination. One in particular where the lead character bought a hot chocolate that was “so thick and rich, that the spoon stood up all by itself”. I was mesmerized! I had no idea what hot chocolate was. I imagined someone melting huge vats of chocolate bars and selling them as a drink… so thick that you needed a spoon to eat it!